The roommate dynamic is a fairly interesting one: you may end up becoming lifelong best friends with someone that you once never knew, or you may end up becoming mortal enemies with your once-best friend. Living with roommates and complaining about the pile of dishes “soaking” in the sink is practically a tale as old as time itself, and with that being said, it’s about time to improve the college roommate game as we know it. 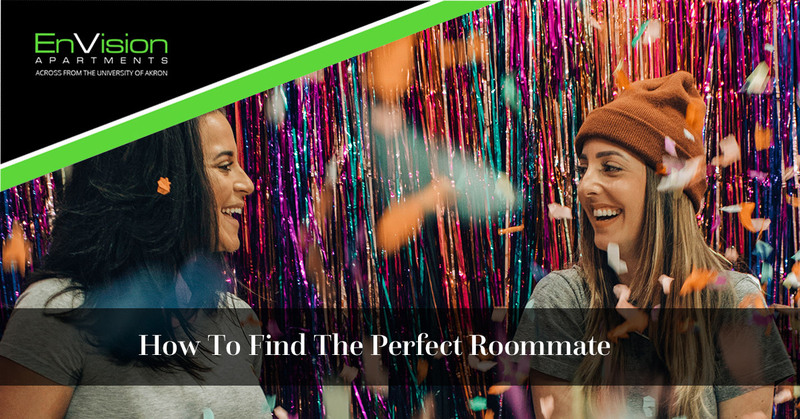 The truth of the matter is that, unfortunately, there’s no 100 percent perfect system to find the perfect roommate or roommates. Even the most amicable and agreeable of people tend to clash heads at a certain point, and resolving this type of domestic conflict is, in all honesty, a valuable life skill. While every moment with your roomies may not be absolute bliss, EnVision Apartments provides an easy and convenient way to find a roommate that’s compatible with you. That’s right! Our roommate matcher consists of a multi-step online form that touches on various questions about who you are, what your ideal style of living is, and what you’d like to see in a fellow living mate. We listened to University of Akron students’ previous experiences at other Akron apartments, and one of the central complaints was that there was little to no true roommate compatibility. Sure, you’re not here to find your lifelong soulmate, per se, but it only makes sense to get along with the people that you’re living with. After all, you’re here to be productive and learn, so a stress-free living situation is what you need (and what you deserve!). This part of the form is pretty simple, and consists of basic information about yourself such as your full name, current address, phone number, and email address. We’ll also ask you about your current major and your projected classification (Freshman, Sophomore, etc.) when your next desired lease begins. From there, we’ll inquire about what you’re looking for in your physical apartment space. Do you want just one roommate, or two roommates? We’ll also ask you about your desired floor preference, what bedroom you’d like (relative to the floorplan), and the preferred gender of your roommate(s) (gender fluid and coed roommate situations are an option). Again, this is by no means a flawless matchmaking system, but by filling out the following information, we’ll be able to better sort through applicants to find a roommate (or two) that closely align with who you are and your style of living. It doesn’t get much better than that! Inquire About Our Student Apartments In Akron Today! Questions about our roommate matching form? Feel free to contact the team here at EnVision Apartments. We’re happy to help! Check Out Our Roommate Matcher For Yourself Here!